Milton Avery: Works on Paper, National Gallery of Art, Washington, 1994-1995, no. 22. Milton Avery: Works on Paper, The Hyde Collection, Glen Falls, 1995, no. 22. Milton Avery: Works on Paper, Allentown Art Museum, 1996, no. 22. Milton Avery: Works on Paper, James A. Michener Art Museum, Doylestown, 1996, no. 22. Milton Avery: Works on Paper, The Snite Museum of Art, Notre Dame, 1996, no. 22. 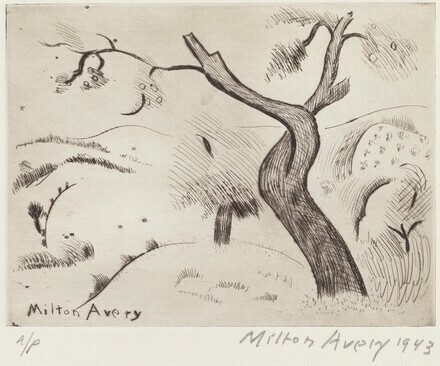 Lunn, Harry H., Jr. Milton Avery: Prints 1933-1955. Washington, DC: Graphics International Ltd., 1973, no. 25. Owens, Carlotta J. Milton Avery: Works on Paper. Exh. cat. National Gallery of Art, Washington, 1994: no. 22.